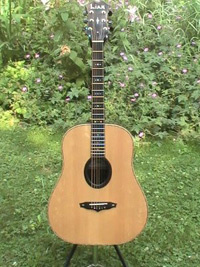 This guitar was recently completed in early April of 2010. I built this instrument for to be a part of a project that was launched by a luthier named Denis Merrill from “Darling Guitars” (website) Denis 's vision is to prove or disprove the theory that instruments tonal qualities change over time. He proposed that a series of instruments be built at the same time using wood that was nearly identical, sourced from a small section of an old growth Sitka Spruce tree. The wood selected was well quartered with an unusual reddish color, highly bear clawed, with a high count of grain lines per inch. For more on the “Sonic Sitka Project”, go to Guitarbench.com and click on the “specials” tab) I debuted this instrument at the Newport Guitar Festival , held down in Hollywood Florida at the Hard Rock Cafe in April,2010.There was about 30 or so other builders there that participated in the project. We were all allowed free reign on our selections of body style, woods and finish.I chose to build a “sloped shoulder” dreadnaught with a neck/body joint at the 12th fret. I have affectionetly named it the "Maverick"